We all remember the controversy of SCRABBLE Trickster back in April. SCRABBLE + Mattel + Proper Nouns = BLASPHEMY! Some thought it was just a PR hoax, something to rattle the bones of diehard SCRABBLE players, like myself. Others thought it was an April Fools' Day joke. But deep down, we all knew it would come, and the youth of our generation are welcoming it with open arms. 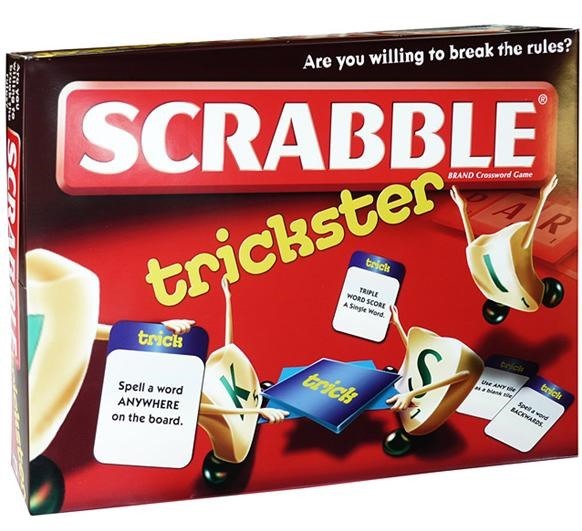 Regardless of anyone's opinion, Mattel has finally released SCRABBLE Trickster in the UK, Germany, and other European countries. But don't worry North Americans— it will never see the light of day in stores. 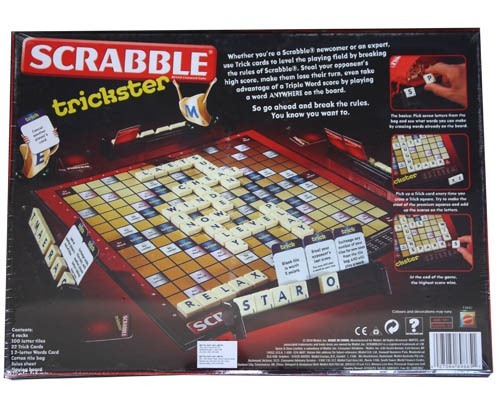 Hasbro, who owns the rights to SCRABBLE in North America, has no plans to release SCRABBLE Trickster, or any version like it, in the United States or Canada. Whether you're a Scrabble newcomer or an expert, use Trick cards to level the playing field by breaking the rules of Scrabble. Steal your opponent's high score, make them lose their turn, even take advantage of a Triple Word score by playing a word ANYWHERE on the board! So go ahead and break the rules. You know you want to. I know I don't want to. I'm a fan of the classic gameplay, the way word enthusiasts across the world have been playing since the game's introduction as the "SCRABBLE Brand Crossword Game" in 1948. The rules established were simple and easy to follow, and they explicitly stated NO PROPER NOUNS. Now, in SCRABBLE Trickster, players still draw seven tiles to form words on the gameboard, but the twist of this hip version of the classic SCRABBLE game now allows proper nouns, such as cities, celebrity names and companies. Not only that, but you can now play words backwards and you can place words on the board unconnected to others. Just like regular SCRABBLE, each word on the board earns points based on the letter values, with certain bonus squares providing extra points. But it also incorporates Trickster spaces and cards that allow players to break all the traditional boundaries with chances for bigger and better scores. Mattel says this game is just a limited edition, and that it will not replace SCRABBLE, but I can't help but think that this is still a bad idea. SCRABBLE is an educational game, a way to learn (and want to learn) new words, to better your vocabulary... to expand your lexical knowledge. And SCRABBLE Trickster is the exact opposite, encouraging players to become lexicologically lackadaisical. One British blogger called SCRABBLE Trickster "an act of desperation by the makers, who have presumably noticed that not only can younger people not spell, read or write, they will cry off to their PlayStations if asked to cope with the simple and necessary rule prohibiting proper nouns." And John Chew, co-president of the North American SCRABBLE Players Association (NASPA), commented that, "When you see kids playing who are not serious tournament players, the stuff you see on their board, it would look more in place on a cellphone texting screen. You see people spelling 'girls' with Zs, and LOLs." No longer do you have to try your hardest to come up with the best word— there's endless possibilities! Plus it's a slightly ambiguous game now (depending on who you play with), with an infinite amount of proper nouns available, who's to say which ones are allowed and which ones aren't? Is Microsoft playable? Shaq? Jesus? Probably, but how about YouTube, iPhone, and Jay-Z? The rules for SCRABBLE Trickster make the game entirely undemanding and unchallenging. Is this what we want to teach our children? Haven't video games done enough to undermine our culture and weaken our attention spans? Now SCRABBLE wants in on the action? Would a new SCRABBLE dictionary be needed to circumvent the anxieties of the ambiguous rules of SCRABBLE Trickster? Aside from the Official SCRABBLE Players Dictionary (OSPD) and Official Tournament and Club Word List (OWL), will there be an Official SCRABBLE Players Dictionary: Debauched Edition (OSPDDE)? Absolutely not. For one, it would be impossible to consolidate regular words and proper nouns into a small dictionary form. And two, who cares? A game like this doesn't require this much thought, so why am I even writing about this? With the National SCRABBLE Championship currently under way in Dallas, Texas, one can only wonder what master players like Nigel Richards, Dave Weigand and Joe Edley are thinking. But NASPA and the National SCRABBLE Association (NSA) have no plans to ever, EVER, incorporate SCRABBLE Trickster into their clubs and tournaments. Thank God. Speaking of God. This new game is practically sacrilegious. It's like slapping Jesus in a commercial for Trojan Condoms. It's blasphemy. Or maybe not, since Christian Condoms have already done it. But as much as I hate the idea for SCRABBLE Trickster, I must say that it doesn't really matter in the long scheme of things. I'm making this a bigger deal than necessary. I know I am. I'm just hoping it never reaches the shores of America. 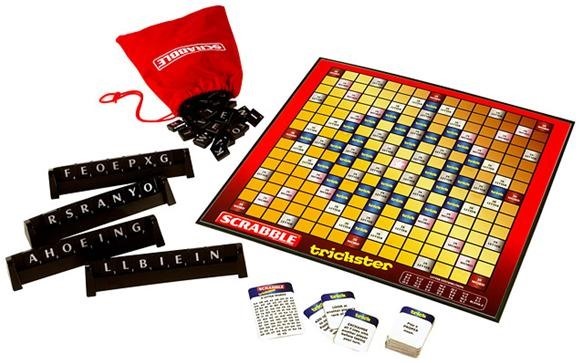 Overall, SCRABBLE Trickster is trendy, and won't stand the test of time, but might actually persuade more people to play SCRABBLE the way it was meant to be, which in the end, is a good thing. News: OMG, Scrabble Trickster Lets Players Use Textspeak… What's Next? News: Kate Hudson a Scrabbler?